Is Obama a Saints WR or a Pats DB? In this video, is the President catching a pass from Drew Brees, or is the President being a total weenie and stepping in front of a pass intended for a kid? In any case, it's good to see Mike McKenzie in a Saints uni in a commercial whilest knowing he's actually a Saint again. In the 1960s and 70s, New Orleans and Louisiana took a risk by investing in the Louisiana Superdome. There was strong and principled opposition to the project. I have no doubt that there was corruption somewhere in the process of construction. In the end, though, the result was a world class building with staying power. Poydras Street and a whole section of downtown were transformed. Dave Dixon and others got all of this started. I bring this up today, because now we learn that the Pontiac Silverdome, built AFTER the Louisiana Superdome, has been auctioned off for $583,000--less than the cost of many homes in greater New Orleans. I am thankful for the visionaries of New Orleans who built a great facility--soon to be renovated further for yet another new life--in downtown New Orleans, and not in the suburbs (as Detroit's not-so-visionaries did). One of the real assets here is that the Dome is walking (or biking!) distance to and from so much of what we consider the core of our city and region. One the one hand, the Corps wants to be able to inspect levees while the river water is high. This need threatens the river parish bonfires. Maybe I'm a Scrooge, but levees seem pretty important to me, so on the face of it I'm glad the Corps is looking out for us. On the other hand, the state says the Corps has been wasting precious river silt as they dredge. If true, this is the kind of almost criminal negligence that must be highlighted by all of us as often and as loudly as possible. No, the New England football squad are either "the Pats" or "the Past." When I think of the Pats, I think of old times. 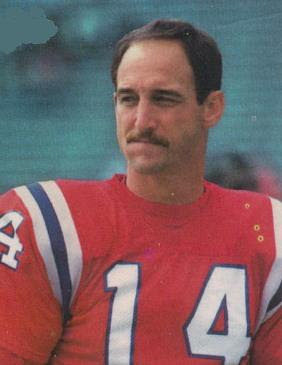 Pats starring a quarterback named Grogan. Pats getting beat down in the Louisiana Superdome. When I think of Our New Orleans Saints, I think of the present and future. The third Dillyberto brother will join Berto and me for the Saints-Patriots game on Monday Night Football. And he will be properly attired. See below for my order today. Look, revenge is a very unattractive thing, but I just gotta get this out. I spent three terrible, horrible, no good years in the state of Missouri. Those were the three worst years of my life. 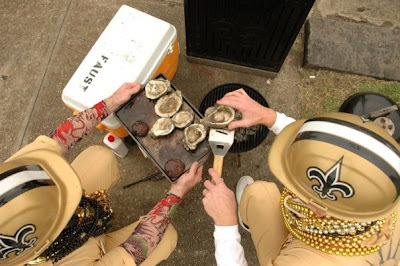 Then I returned to New Orleans, and a few years later had to endure the Rams winning the Super Bowl, followed by some very disappointing losses by the Saints to them (although that playoff win by the Saints was a beauty). Then two years ago we were subjected to the humiliation of losing to a winless Rams team whose defense was coached by Jim Haslett and Rick Venturi. This is what it looked like at Lee Circle (Tivoli Circle) yesterday at around 2:15 p.m.
Do it, Drew. Crank it up. Charles Grant, show your homeboys what you've become in New Orleans.